The Cateye Strada Smart is a simple solution to displaying ride data on your bar if you use your smartphone to record your activities. It's only really going to be a viable option if you haven't already bought into ANT+ sensors, and it's not as configurable as some other options, but it will tick the right boxes for some riders. Our last user survey revealed that two thirds of road.cc users record their activities using a smartphone, mostly with Strava. The vast majority (86%) don't mount the phone on their bars though. So, how to keep track of your ride data? There are some solutions to this problem already, of course. The Wahoo RFLKT and the O-Synce Coachsmart are two that spring to mind. Both of those connect to any ANT+ sensors you have and feed that data back to your phone via a Bluetooth connection, and the phone supplies GPS data. The Strada Smart is slightly different in that it's Bluetooth only. You can use the Strada Smart in one of two ways, Mirror mode or Sensor Direct. In Mirror mode, you pair the sensors with your phone, and use that to gather data. The app on the phone pushes the numbers to the Strada Smart head unit. You can pair pretty much any Bluetooth sensor, including power-measuring devices. In Sensor Direct mode, the sensors are paired directly with the head unit, hence the name. That means if you're not taking your phone on a ride you can still use the Strada Smart, although obviously you won't get any GPS information as that's supplied by the phone. Setting up the Strada Smart was pretty straightforward. 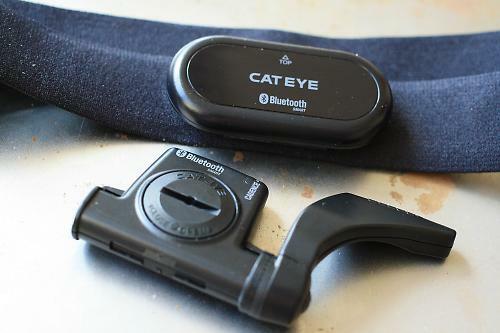 Once you've installed the Cateye Cycling app it's a case of going through the settings to get everything paired up; it was simple enough with both Cateye and non-Cateye sensors. Pairing the head unit to the phone is straightforward too. Once everything's talking to everything else you can hit record on the app, stick your phone in your pocket and you'll get the data fired through to the head unit. Standard recording interval is one second, although you can set it to two or five if you prefer. There's an option to auto-pause the recording when you stop, or you can press the head unit for one second to pause, and the same to resume. Setting up the head unit in Sensor Direct mode is a bit more of a fiddle and it's handy to have the instructions nearby. But to be honest it isn't a mode you're going to use much. You're only really going to be interested in the Strada Smart if you're using your phone as your primary recording device. If you want a standalone solution then you can get a GPS computer with ANT+ sensors for the same money as the Strada Smart; Cateye themselves make one, the Stealth 50. So you'd most likely do that. The odd time when you forget your phone, or it's out of battery, then it might be useful as a fallback. The head unit has enough storage space to hold a few decent rides. So let's assume that you're using the Strada Smart in Mirror mode, to show the data that your smartphone is recording. Does it do a good job? Yes, pretty much. The connections between the app and the sensors and head unit seem very stable – I've not had any issues with sensors or the head unit being dropped – and the different data is easy to access via the clicky head unit; like most Cateye computers, the whole head unit is basically a button, so you tap it to switch views. There are two main data fields. The one at the top displays speed by default, although it can be configured to show heart rate or cadence if you prefer. The bottom field cycles through the different available data on each click. There's total distance, elapsed time and two trip distance counters, plus altitude in Mirror mode and heart rate, cadence and power from any paired sensors. Average and maximum values for speed, cadence, heart rate and power are also available. If you're used to looking at a Strada computer – or any small computer – then the Strada Smart is much the same. The readout is clear and easy to understand, although it takes a bit of time to remember where you're looking for the little symbols that tell you what display you're on. The LCD screen isn't as configurable as a dot-matrix display would be, and can't show you as much at once, but realistically if you're considering the Strada Smart you're more the kind of person that likes to keep a record of your ride, as opposed to someone who likes having all their data to hand in real time. Cateye's Cycling app syncs easily with Strava and TrainingPeaks and allows you to push your rides to Cateye's own portal, Atlas, as well. That ship has sailed, though: there's very little on Atlas. You can share your exploits on Facebook and Twitter too. The app is okay, but it's not as polished as some of the other options for recording on your phone, and feels a bit clunky at times. It's been updated a couple of times since I got the Strada Smart, and is getting better, but it's not the seamless experience of the Strava or Wahoo apps, for example. So, is the Strada Smart for you? Maybe, if you're wanting to use your phone and you don't have any ANT+ sensors already. It's a simple enough solution for recording your data and getting some of it to your handlebar. It's a pretty expensive way of getting it done, though, for the amount of data you can view at any one time. The Strada Smart isn't great value as a package: the Cateye Bluetooth sensors are far from the cheapest, adding £90 to the price of the head unit. It's worth shopping around for cheaper alternatives for the sensors and buying the head unit separately if you think it'll suit your setup. The Strada Smart connects with your smartphone through the CatEye Cycling App. The Strada Smart is mounted on your handlebar or stem, while the smartphone is stashed out of harm's way in a pocket or saddle bag. In Mirror mode, the smartphone records ride data and transmits a copy to the Strada Smart. Phone call and email alert icons are also displayed. The phone is kept in sleep mode, preserving the battery. The Strada Smart can work with Bluetooth Smart Speed, Cadence, Heart Rate and Power sensors in this mode. When smartphone use is not an option, Sensor Direct mode can be used as a back up. Sensor Direct mode syncs the Strada Smart directly with the Bluetooth Smart Speed, Cadence, Heart Rate and Power sensors, so important ride data is always available. It's pretty good, but not as configurable as some. If you already have ANT+ sensors you'll want another solution. App is clunky, could do with more configurable screen. Compared to the RFLKT it seems like a lot more money for less functionality and usability? So I'm a little unclear on whether you can run the Strava app and use this without having to run a separate app. Agree with the above comment - RFLKT looks much better value. Personally I've heard so many bad things about dropped connections with bluetooth sensors that I'm sticking with ANT+ despite the positive comments on that in this review. There are smartphones that support ANT+ with decent battery life now if you want to use a phone. So I'm a little unclear on whether you can run the Strava app and use this without having to run a separate app. So if I just want to see my GPS/ride data etc and with no need for HRM or Cadence info, i'm setting off i'm pressing record on both my Strava app and a Cateye app? I'll be honest the small size works for me, and if you don't need/desire cadence and HRM it seems a cool option. It also apparently tells you when a call is coming in...... (good or bad thing i'm not sure). I have one of these (just the head unit) and I like it. You use a separate Cateye app which uploads seamlessly to Strava upon completion. I've had no issues with it and it works flawlessly for me. I like the small size and the way it alerts you to calls and texts when you're on the road. I'm hoping for turn by turn GPS in an update but not holding my breath. I use a Garmin Edge 200 and I love that it doesn't alert me if I have a call or text coming through. Out on my bike seems to be the only place I can be away from calls texts and emails. Surly a Garmin 500 or Touring represents better value for money? I suppose the Cateye is more compact.